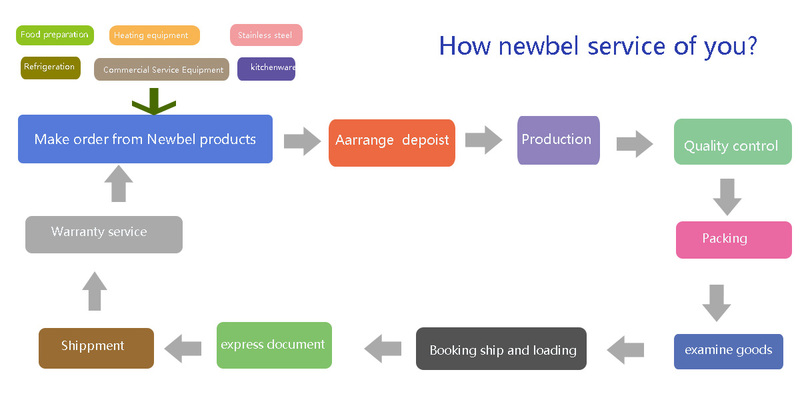 Newbel catering equipment CO.,LTD is one of the leader catering equipment suppliers in China. It is committed to providing high quality competitively priced and professional restaurant products ,bakery equipment, processing equipment, refrigeration and showcase, Stainless steel products, beverage equipment, Packing machine. As manufacturer and exporter, we can meet your demands in design and logo and so on. Any question,pls feel free to contact with us. Over the years, Newbel's products have been sold to Europe, American, Australia, Africa,, the Middle East, Southeast Asia and other areas. We join hands with more and more customers in the world to enjoy the catering equipment market. Our professional teams sincerely expect to cooperate with domestic and foreign customers to create a beautiful future together!